I am a bit of a mountain snob. Perhaps it’s being born in Wyoming and raised in Colorado; maybe I’m a mountain snob because of expeditions to climb Rainier in Washington and Denali in Alaska. For whatever the reason, I remain thoroughly unimpressed by the elevation of the Black Hills area in South Dakota. Technically the Black Hills are foothills of the Rockies, created by the Laramide Orogeny just like the Rockies. Black Elk Peak (formerly Harney Peak), the highest of the Black Hills even boasts being the highest point in elevation between the Rocky Mountains and the Alps (obviously a lot of that distance is open ocean). The main difference between Black Elk Peak and what I consider a real mountain in my mind isn’t pure elevation but an ecological distinction. As you climb a mountain, you pass through different biomes created through climactic differences caused by elevation. 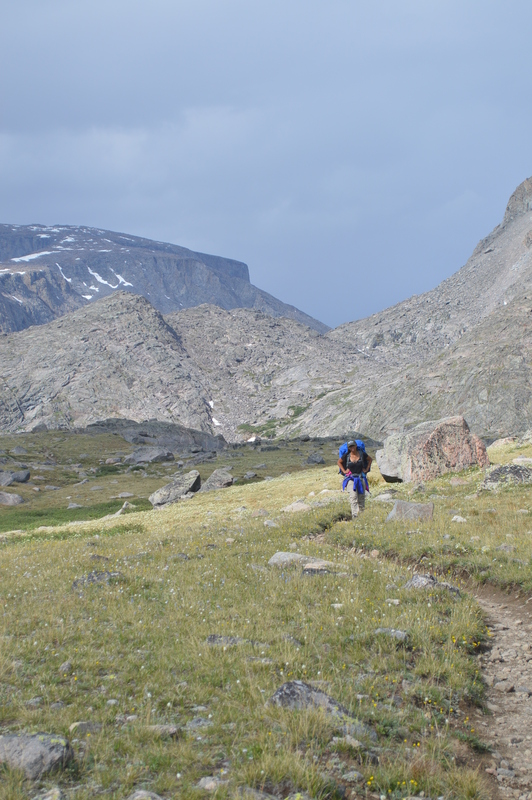 In Colorado you reach the edge of tree line and start into an alpine environment at around 10,000 feet. In Alaska the alpine environment is reached at a much lower elevation; Mt. Marathon near Seward was a real wake up for me, a peak only 3,022 feet high with mountain goats, ptarmigan and snow in the summer. Black Elk Peak has no real differences in biomes, no alpine environment. So even though Erin and I had hiked Black Elk Peak, I couldn’t say she’d truly summited a mountain until we turned our sights a little westward to a higher peak. Wyoming is a state with real mountains, so last summer we headed to the Bighorn Range, an area where Teddy Roosevelt once hunted for bighorn sheep. We set out to hike Cloud Peak, the highest point in the Bighorns, a 13,167 ft. mountain from the top of which a glacier can be seen crumbling into a cerulean lake. The trip to the top of Cloud peak is a small back packing trip that took us past a few lonely mountain lakes. Nearby is Bomber Mountain (there’s a local beer named after that one) where a U.S. plane crashed during World War II killing everyone on board. We saw moose and elk in the lower elevations, coming dangerously close to a terrified elk in our Jeep at night. In the higher elevation we saw marmots and pikas; I even saw a weasel slinking through the rocks near our camp. The first day of the trip took us through forest plagued by mosquitos and past lakes of increasing elevation until we were camped at Misty Moon Lake above tree line with fewer mosquitos. Reading Craig Child’s essay on mosquitos in his book The Animal Dialogues while we were camped put everything in perspective; at least we weren’t camped along a northern Alaska river where mosquitos are like air. From Misty Moon we had to find a rougher route to the top and initially we failed, the route not being very clear on the map we had and having lost the directions we’d printed off. By the time we’d figured out where to go, it was too late to summit at a reasonably safe time (thunder storms notoriously role in around noon in the mountains in the region). So our first trip to Cloud Peak was a great, fun back packing trip but a failure for summiting the mountain. We returned about a month later to be thrilled by the absence of mosquitos; although it was a little chillier on the mountain. This time we successfully made it to the top of the mountain, making our first night’s camp at a waterfall of lower elevation than Misty Moon but closer to the standard summit route. The summit was gorgeous, one of the nicest I’ve experienced, with a glacier just off the summit (glaciers are extinct in all of Colorado, the place I’ve summited most of my mountains). We even had the summit all to ourselves for quite some time. Erin was a champ on this; her first real mountain!